Networking and FDA 21 CFR Part 11 Compliance. LabSolutions DB/CS ICPMS provides compliance for regulations concerning electronic record keeping and electronic signatures required by FDA 21 CFR Part 11 and other regulations stipulated by Japan's Ministry of Health, Labor and Welfare (ERES regulations). 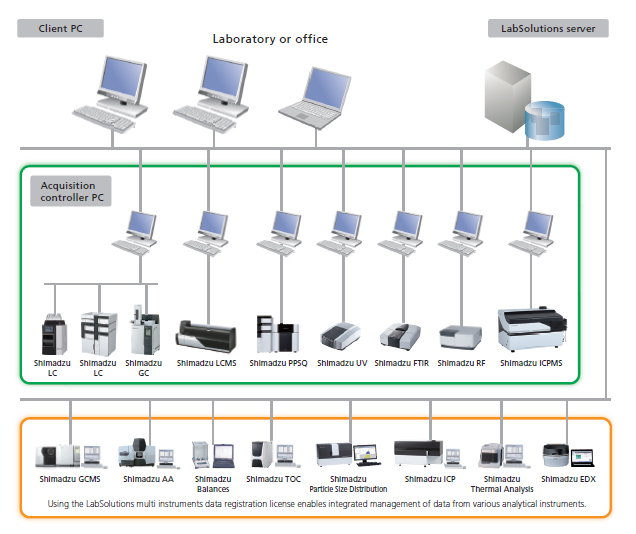 Additionally, since the software supports laboratory networking, analytical results from a broad variety of analytical instruments used in the laboratory, including LC, LCMS, GC, GCMS, UV, FTIR, RF, EDX, TOC, and PPSQ, can be managed centrally from a server. LabSolutions CS can freely access all instruments on the analytical network, so that all analytical data is managed on the network server and the data can be loaded to any computer connected to the network. This is especially recommended for customers that have many users and want to manage data on a server together with LC, GC, FTIR, UV, RF, EDX, TOC, PPSQ, and other data for ER/ES compliance. This configuration does not require a network connection and is ideal for customers that want to manage all data on one computer for ER/ES compliance only for a standalone system.